Welcome to our gallery of fun teen girl bedrooms. Designing for a teenager’s room could be very challenging as it is a period of many changes, both stylistically and physically for its user. It is a period when one tends to want to express more of herself and her personality into everything, and it could be challenging to express their personal style and translate it into the design of their bedroom. As the bedroom is a very personal space, it should allow its user to be able to express their individuality, to encourage self-expression and boost confidence. In the picture above white walls and solid Mahogany flooring create a nice blank canvas for any style of room and will work for any gender. The plain white walls makes it easy to add more textures, colors and patterns to other elements in the room, such as the bed sheets in this example. The sage green with red floral patterns stands out and emphasizes the feminine appeal of the space. Other elements such as the mirror finish vanity and the dandelion lamp also contribute to give this space a more feminine appeal. Accent Lighting – Unique lamps and mood lights is able to create different moods and create a different ambiance to any room. There are many different and unique ceiling lamps which you can use such as a dandelion lamp to give it a feminine charm, or a driftwood lamp to give your room a mysterious feel at night. 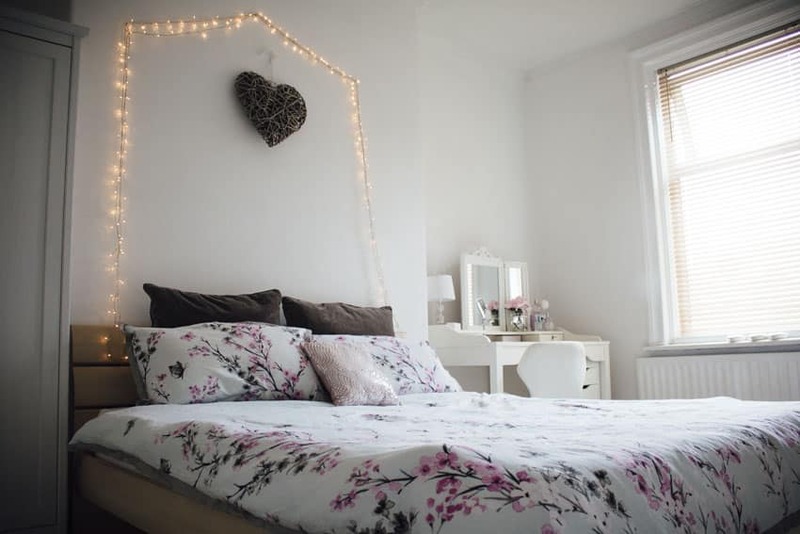 Other fun lighting ideas for teen bedrooms would be fairy lights or marquee signs. Accent Chairs – Simply adding a unique accent chair to a room helps spice it up. You can use something that stands out or reflects the individuality of its user. You can add a hammock, a swing chair, a bench, a bean bag, or something as simple as a ghost chair. Wall Accents – This could be in the form of framed art pieces, wall sculptures/art installation, or even something as simple as cut-out initials or wall decals. Patterns and Prints – bold and unique combinations of patterns and prints can easily be applied on accent pillows, bed sheets/covers, and even on furniture upholstery. You can’t really confine femininity with pinks and pastels and flowers. Sometimes, a girl prefers more neutral tones, and that’s what this teen bedroom is composed of. It has a neutral color scheme composed of whites and grays and has a sophisticated minimalist feel, which will definitely still be in style even as she grows into adulthood. 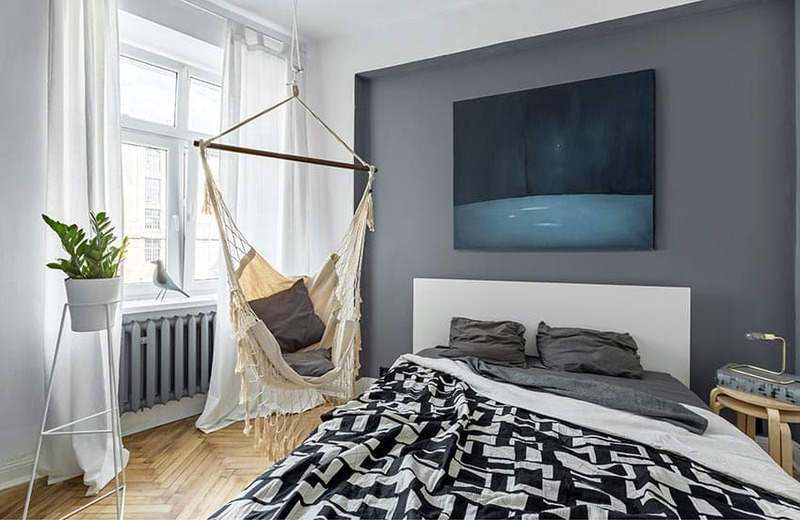 One notable element of this bedroom wood be its hammock chair placed by the window, which gives it a unique and a more laid-back feel. For ladies who love flowers and pink, this bedroom would be a dream come true with its dainty white and pink color scheme. 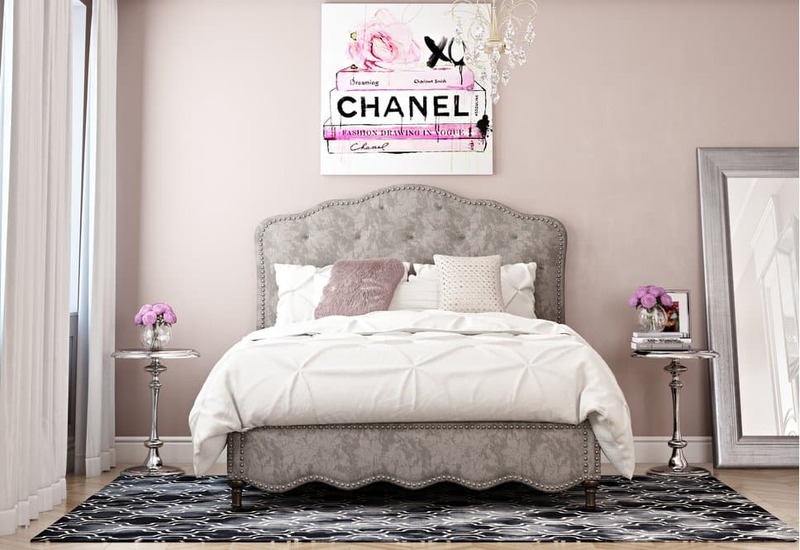 Plush carpeted floors were combined with soft pink walls and is furnished with all white furniture pieces, giving it that dreamy & dainty feminine look. Violet or Purple gives a more sophisticated & mature feel, as it is a color often associated with royalty. This fun bedroom has gorgeous textured wallpaper in a gorgeous marsala color, and is furnished with classical-inspired pieces, painted in solid whites and purple. Adding more eclecticism to the design are the clear acrylic furniture pieces such as the bubble chair and the acrylic chair. 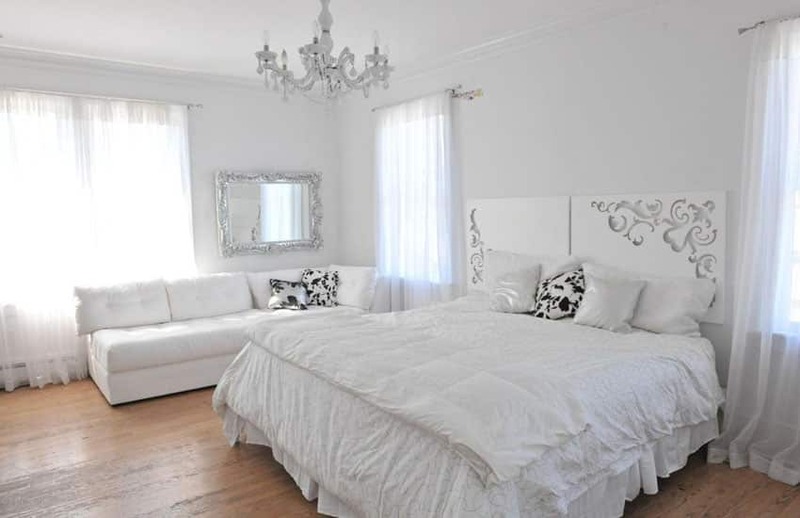 An all-white color scheme is also a great choice for teen girls bedroom, as white can easily be transitioned and combined with other colors and styles, as one’s taste or trend changes. This bedroom uses all white furniture pieces and even fabrics, and the only other colors you will find will be the wooden floor and the black prints on some of the accent pillows. A quirky teen bedroom with a monochromatic color scheme, it mainly plays with the combination of different black & white patterns to create a fun and youthful feel to this small bedroom. You will see stripes, crosses, polka dots, and it even uses chalkboard paint as the accent wall, making the surface writable and multi-functional. For this bedroom, it focuses on using neutral colors for the general finishes and furniture pieces to balance out the bold colors and prints which were used as accents, such as the bright pink blanket, gold accents and the teal throw pillows. The use of neutral finishes and furniture pieces also makes it easy to transition this bedroom into a more mature style. This gorgeous bedroom uses colors and finishes with subtle dusty pink undertones to give it a soft & feminine appeal, while still keeping a neutral base palette. The result is a soft & romantic look which will definitely appeal to teens and adults alike. Teenage years is a wonderful time to explore one’s creativity and individuality, and aside from fashion, another channel to express it would be in your bedroom decoration, just like this example. It boldly combines different wallpapers, patterns and colors which expresses the personality of its user. A timeless transitional style bedroom with a twist. The general palette uses neutrals and adds baby blues for accent, giving it a timeless appeal which will attract teens & adults alike. To give it a more youthful feel appropriate for a teenager, blue stripes were added to the walls, along with a cut-out initial and some wall decals to represent the hobbies of its user. This bedroom focuses on multi-use and functionality to maximize the limited available space. Instead of a regular bed, a gray sofa bed was used and a soft pink tulle canopy was added to give it a dream-like appeal. Pink accents were also used to give it a more fun and youthful vibe, while the fairy lights adds a romantic illumination to the space. Albeit unusual, this bedroom combines neutrals with silver & reflective finishes giving it an avant garde feel. While the floors and walls keeps that soft bisque color for a light and soft background, the bed headboard has a mirror finish, while the wall art sculpture is made from stainless steel. Additionally, the bed sheets and pillows also use metallic fabrics, giving it modern and unique look. Using red in a bedroom could be tricky, but was pulled-off well in this teen bedroom. It keeps the neutral finishes of the walls and floor, but adds a consistent shade of red as an accent wall, and was also used on the accent pillows and the curtains. The consistency of reds used in the room makes it look cohesive and organizes, creating a bold and adventurous feel to the space. 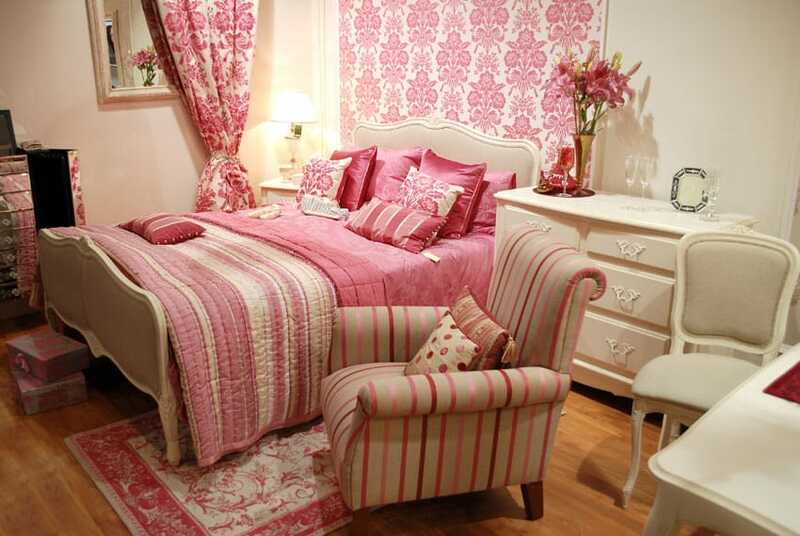 This is a very simple teen girl’s bedroom with a very subdued feminine appeal. The bedroom has a neutral color palette with its bisque walls, white furniture and maple wood bed. The boldest color in the space would be the soft pinks found in the cherry blossom pattern on the bedsheet, which gives the space a subtly feminine feel. Using a neutral color palette for a teen girl’s bedroom isn’t necessarily boring. You can still achieve a youthful vibe to any space without making it look tacky, as demonstrated in this example. 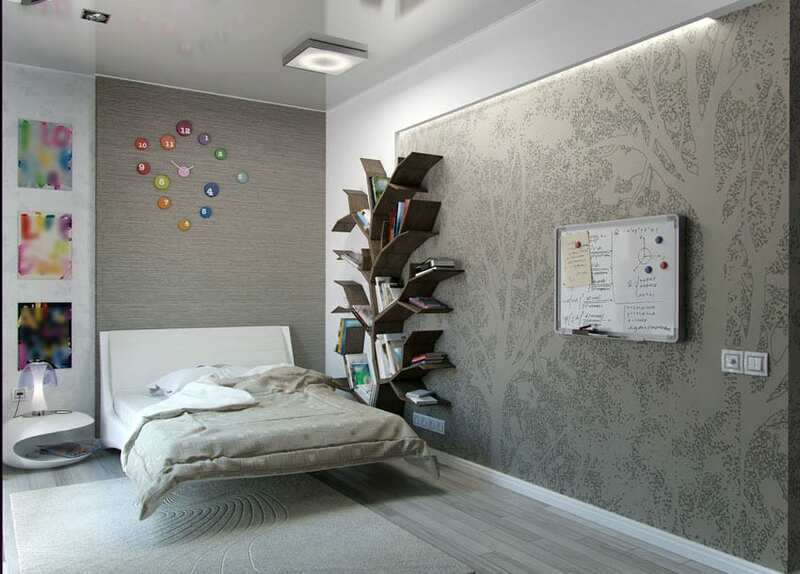 The bedroom uses elegant wallpapers and generally neutral finishes, but adds fun elements such as a tree bookshelf, a fun and colorful wall clock and some unique and colorful artworks to inject that youthful vibe to the space. An eclectic and psychedelic bedroom which features a unique combination of purples and reflective colors/finishes makes this bedroom come alive. It features different modern patterns and finishes which seems to glow in the dark giving it a modern and futuristic appeal. This bedroom will make you feel closer to your dream of becoming a modern-day princess with its gorgeous Rococo-inspired styling. The gorgeous bedroom is inspired by Rococo, and interpreted in a more modern aesthetic, by using soft neutral colors and toning down the general sardanapalian tendency of the Rococo style. The white tufted bed is framed by soft white, pink and blue tulle canopy, and instead of heavy damask patterns and gilded panelings, the paneled walls were painted white, and another in antiqued turquoise to give it a fresh and modern feel. 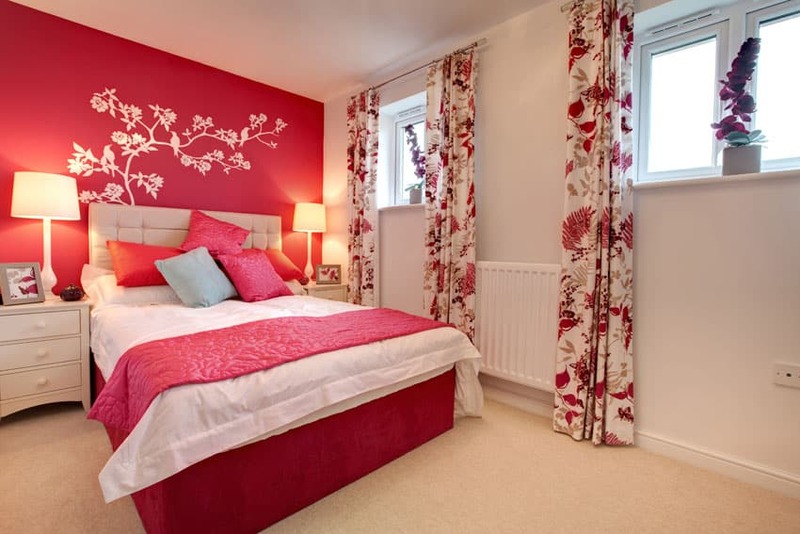 The affinity for pink in this bedroom is definitely expressed. By using neutral finishes on the walls, floors and the furniture pieces, it allows the use of bold pink prints on the bed sheets, pillows, wallpaper and curtain, helping balance the overall look so that the different patterns and textures don’t clash. This modern teen bedroom features an uncommon, yet gorgeous combination of steel blue and green for its color scheme. Sage green walls provide a cool and easy on the eyes feel to the bedroom, while the large prints on the bedsheets help make the bed look and feel more massive. Using white or neutral furniture pieces makes it easier to make use of bold colors such as teal. This bedroom successfully tones down the teal accent wall by using white furniture against the wall. In contrast, the opposite wall uses white paint, and applies teal on its bed sheets instead. Soft lilac painted walls, maple wood floors, and white furniture pieces create this dreamy teen girl bedroom. It features matching furniture pieces, as well as matching fabrics on the bed and the curtains for a very cohesive look.